The Skechers Foundation announced that it has reached a new donation record for the 2015 Skechers Pier to Pier Friendship Walk  surpassing this year’s $1.2 million goal to raise more than $1.4 million for children with special needs and education. Co-sponsored by Nickelodeon and elevated by the support of generous sponsor events like Steel Partners’ #P2PSteelSports Selfie Challenge donation pledge, the Walk drew more than 12,000 participants, and continues to reach new attendance and donation highs annually since its 2009 launch. 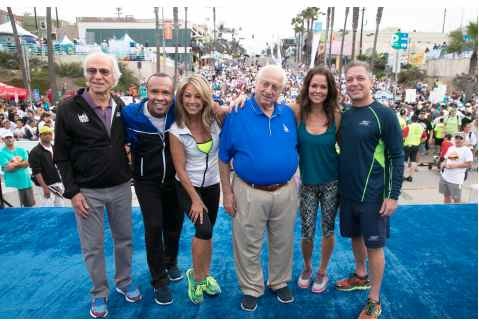 Many celebrities turned out to support the Skechers Pier to Pier Friendship Walk, including boxing legend Sugar Ray Leonard in his first appearance at the event, as well as TV personality Brooke Burke-Charvet, fitness expert Denise Austin, and Hall of Fame baseball manager Tommy Lasorda, who have all made multiple appearances throughout its history. Now one of the largest events in Southern California supporting children with special needs and education, the Skechers Pier to Pier Friendship Walk supports The Friendship Circle, an organization that assists children with special needs and their families through one-on-one peer mentoring and social recreational programming  as well as funding education foundations to retain vital academic programs, maintain smaller class sizes, improve libraries, and upgrade school technology. The Skechers Pier to Pier Friendship Walk thanks presenting sponsor Nickelodeon and many generous sponsors including Wells Fargo, Steel Sports, South Bay Vein and Laser Group, The Claudette and Ethan Rickett Care Foundation, Ross, Zappos.com, Tour de Pier, DIRECTV, United Legwear & Underwear Co., Body Glove, Kids Foot Locker, United Legwear, JAKKS Pacific, Marshalls, Cushman & Wakefield, Caskey & Caskey, Siltanen & Partners Advertising, Continental Development, Northrop Grumman, Equinox, Chevron, and many others who have provided funds and support to provide a better future for children. To learn more about the Skechers Pier to Pier Friendship Walk, please visit skechersfriendshipwalk.com or facebook.com/SkechersFriendshipWalk.